First Solar, Inc. has announced full-year 2019 guidance. Investors are encouraged to refer to First Solar’s 2019 Financial Guidance materials, available at investor.firstsolar.com, for more information regarding the above guidance. First Solar has scheduled a conference call for today, December 11, 2018 at 4:30 p.m. ET to discuss this announcement. A live webcast of this conference call is available at investor.firstsolar.com. An audio replay of the conference call will be available approximately two hours after the conclusion of the call. The audio replay will remain available until Tuesday, December 18, 2018 at 7:30 p.m. ET and can be accessed by dialing 888-203-1112 if you are calling from within the United States or +1‑719‑457‑0820 if you are calling from outside the United Statesand entering the replay pass code 6977098. A replay of the webcast will also be available on the Investors section of the Company’s website approximately two hours after the conclusion of the call and remain available for approximately 90 calendar days. 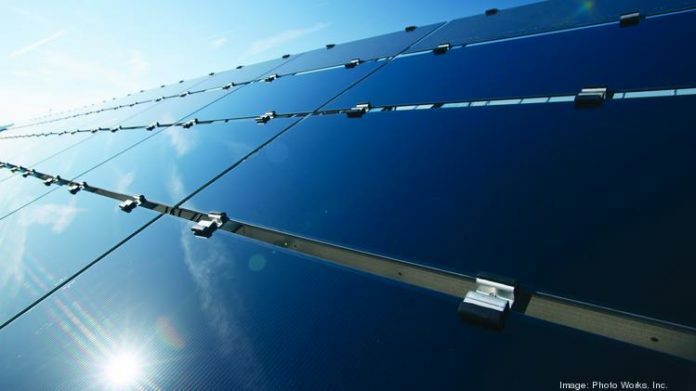 First Solar is a leading global provider of comprehensive photovoltaic (“PV”) solar systems which use its advanced module and system technology. The Company's integrated power plant solutions deliver an economically attractive alternative to fossil-fuel electricity generation today. From raw material sourcing through end-of-life module recycling, First Solar's renewable energy systems protect and enhance the environment. For more information about First Solar, please visit www.firstsolar.com. This release contains forward-looking statements which are made pursuant to safe harbor provisions of the Private Securities Litigation Reform Act of 1995. These forward-looking statements include, but are not limited to, statements concerning: effects on our financial statements and guidance resulting from certain module manufacturing changes and associated restructuring activities; our business strategy, including anticipated trends and developments in and management plans for our business and the markets in which we operate; future financial results, operating results, net sales, gross margin, operating expenses, operating income, earnings per share, net cash balance, shipments, products, projected costs (including estimated future production ramp and start-up costs), and capital expenditures; and our ability to expand manufacturing capacity worldwide. These forward-looking statements are often characterized by the use of words such as “estimate,” “expect,” “anticipate,” “project,” “plan,” “intend,” “seek,” “believe,” “forecast,” “foresee,” “likely,” “may,” “should,” “goal,” “target,” “might,” “will,” “could,” “predict,” “continue” and the negative or plural of these words and other comparable terminology. Forward-looking statements are only predictions based on our current expectations and our projections about future events and therefore speak only as of the date of this release. You should not place undue reliance on these forward-looking statements. We undertake no obligation to update any of these forward-looking statements for any reason, whether as a result of new information, future developments or otherwise. These forward-looking statements involve known and unknown risks, uncertainties and other factors that may cause our actual results, levels of activity, performance or achievements to differ materially from those expressed or implied by these statements. These factors include, but are not limited to: structural imbalances in global supply and demand for PV solar modules; the market for renewable energy, including solar energy; our competitive position and other key competitive factors; reduction, elimination, or expiration of government subsidies, policies, and support programs for solar energy projects; the impact of public policies, such as tariffs or other trade remedies imposed on solar cells and modules; our ability to execute on our long-term strategic plans; our ability to execute on our solar module technology and cost reduction roadmaps; our ability to improve the conversion efficiency of our solar modules; interest rate fluctuations and both our and our customers' ability to secure financing; our ability to attract new customers and to develop and maintain existing customer and supplier relationships; our ability to successfully develop and complete our systems business projects; our ability to convert existing production facilities to support new product lines, such as Series 6 module manufacturing; general economic and business conditions, including those influenced by U.S., international, and geopolitical events; environmental responsibility, including with respect to cadmium telluride (“CdTe”) and other semiconductor materials; claims under our limited warranty obligations; changes in, or the failure to comply with, government regulations and environmental, health, and safety requirements; effects resulting from pending litigation, including the class action lawsuit against us; future collection and recycling costs for solar modules covered by our module collection and recycling program; our ability to protect our intellectual property; our ability to prevent and/or minimize the impact of cyber-attacks or other breaches of our information systems; our continued investment in research and development; the supply and price of components and raw materials, including CdTe; our ability to attract and retain key executive officers and associates; and the matters discussed under the captions “Risk Factors” and “Management's Discussion and Analysis of Financial Conditions and Results of Operations” of our most recent Annual Report on Form 10-K and our subsequently filed Quarterly Reports on Form 10-Q, as supplemented by our other filings with the Securities and Exchange Commission.